While it is a necessity to keep your dog in line while taking a walk, it is especially important to watch how your dog reacts. You do not want to pull your dog too hard on the dog collar or else it will be at risk of harm. It might get to where your dog won’t want to listen to you if you are being too rough. Therefore, you will need one of the best sturdy harnesses and collars on the market for your dog to ensure that your pet will not have to be dragged around by walking. It must be made with a body that is relatively easy to adjust. This should allow for a comfortable fit that the dog will not have any problems with. 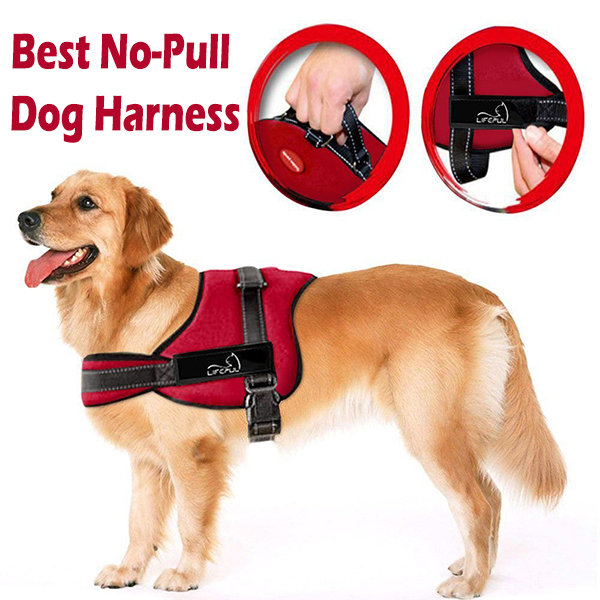 The anti-pull harness is easy to put on and off of your dog. The pressure that is generated by the harness should also be checked. It has to produce enough pressure on the back and chest without disrupting the dog’s natural motion. The attachment features should also be reviewed. You should be able to not only get a leash attached onto it but also get it attached onto a proper belt if needed. With all these points in mind, let’s look at some of the best easy walk harness models with dog collars around. These are designed with many fit options and sizes are will assist you in keeping your dog safe and protected. First, you should look at this choice from Rabbitgoo. It is available in four sizes and offers a simple design. It evenly administers pulling pressure so choking and pulling will not be a threat. 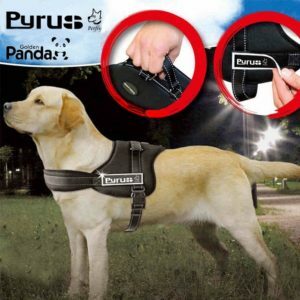 It has two separate leash attachments on the back and chest, thus helping to evenly administer the pressure. The slide straps on the sides of the harness allow you to adjust the fit. This all works with a lightweight material that padded but it still ventilated enough to where your dog won’t feel hot or uncomfortable. It is a great option to have when you are aiming to get the most out of keeping your dog relaxed while walking. This particular harness was made with a nylon webbing material that is light in weight and doesn’t overheat. It uses a reflective material developed by 3M to make your dog easier to spot even in the dark. A strong handle is also included on the back part. A strong handle is also included on the back part. 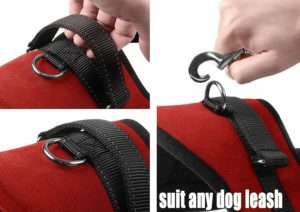 This is useful for getting the rest of the leash on it but it can also be secured onto a seat belt while in your car. The sponge padding parts on the chest and belly keep the dog’s underbody protected. These are paired with mesh lining materials to keep from chafing the dog’s skin. These allow air to move through the harness. The buckles work quickly and have fasteners to help you secure the harness in its place. It comes in five sizes and five colors. This is a black harness that is available in five sizes. You can use the front or back leash attachment depending on the situation. The front one is for use to keep from pulling your dog during a walk. The back on is useful for faster runs and can also be used on the seat belt in your car during a long ride. 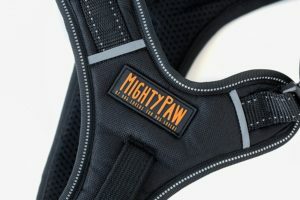 The mesh lining on the harness uses soft sponge padding. The chest supports the underbody of the dog without restricting movements. The shoulders will not be restricted or otherwise unable to move. This especially uses a simple setup that doesn’t contain lots of parts and should be very easy to affix. The latches are also recessed well enough to where you can get the harness to fit on your dog while also keeping your dog from being likely to open it up on one’s own. Pyrus made this harness with a nylon fabric all around. The nylon is lightweight and scratch-proof so it will last for a long time. The release buckle can lock up so it will not be easy to remove by accident. This works with an added handle to keep the dog oriented and goes well with the added clips for the leash. The straps can also be adjusted so a proper fit can work. The padded band allows the dog to feel comfortable and does not result in any added stresses. It does not restrict the dog’s movement but it does help to create a gentle amount of pressure to help direct the dog in any case. This all works in one of five sizes. Available in red and black colors in three sizes each, this Lifepul vest harness has a handle at the upper back part to help you keep control of your dog while walking. This does well for keeping pressure administered as evenly as possible while the chest is not at risk of bearing with far too much pressure. 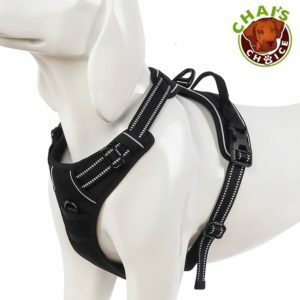 The front part of the harness also comes with a comfortable design that adds enough pressure onto the chest and still keeps the dog’s mobility intact. The interesting part of this harness is that it does not contain any buckles. 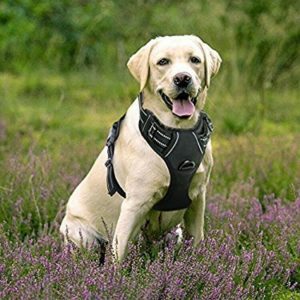 It uses a switch setup that helps you to get the harness open or closed when you are getting it ready for your dog. This makes it very easy to handle without being too complicated or tough. It only takes a moment to get it on your dog’s body. Check out all of these choices for a no-pull dog harness. These should work well for when you’re aiming to keep your dog protected during a walk or anything else where a leash is required. Dog Birthday Treats – One Year Older!